All of us have one unique quality or another. I discovered one of mine while serving as assistant to our senior pastor at Calvary Chapel. Once, when my pastor’s wife, Wendy, was expressing appreciation for my work as her husband’s secretary, she said I was the sweetest pit bull she’d ever known. 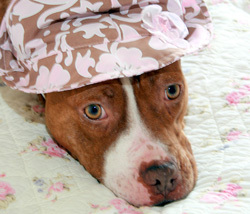 Thanks to maplegirlie on Flickr for the sweetest pit bull picture I’ve ever seen, “Fraulein.” Licensed under Creative Commons. It was one of those compliments you’re not sure how to take. You know what I mean? You think it’s good, but there’s a certain disturbing angle you have to face. I absolutely admit that when I sink my teeth into a project, I don’t let go until it’s complete. That’s good, right? But, okay, maybe I might have a tendency to maul anyone or anything that gets between me and my goal of finishing that project. One of my friends recognized this gift, too, but he called it my ability to do “polite smacko.” And my husband says I have a talent for telling people no while making them enjoy it. I suppose a gift like this can come in handy at times, but honestly, I don’t enjoy it! Thinking back about my pit bull position on the church staff made me realize that God is the one who gives us our unique character traits. Although they may not seem like entirely pleasant qualities, they exist by design to serve a specific purpose. God, grant me the humility to accept my responsibility to use these super powers to bring order in the church. Lord, give me grace while answering, dictating and collating, courage to keep on emailing, transcribing and filing. For every code red emergency that turns out to have no urgency, Lord, grant me the wisdom to know the difference. And when the next one asks of me, “How soon can pastor meet with me?” May the sincerity of my apology foster understanding. Lord, fill me with serenity throughout VBS and youth band practice, and most of all deliver me from post-counseling traumatic stress. So, what unique and possibly disturbing qualities has God gifted you with for service?